Create new custom elements for your organization without coding at all. Create awesome footer elements in Generator and apply them using Theme Builder! You can edit your elements any time you want, and all the changes will apply instantly. Go to the ShortPoint dashboard and open the Generator. Type the name for your element and paste the copied Shortpoint in the text area below. Save your element. You can edit your element any time you want. Just click on the “Edit” button and do the changes you want. After you open Page Builder you will see the new custom ShortPoint in the end of the elements list. Save the page and check your awesome results. We create amazing footer templates for you. Want to see and try it by yourself? You can preview your custom elements if you want to check how they look. Generated ShortPoints of type footer will appear in the Theme Builder and can be applied as a footer to the whole site. To know more about footers and how to apply a footer on your site click here. Tell our designers and engineers what elements you wish to have, and will be more than happy to create them for you. In most cases, we do this FREE OF CHARGE. 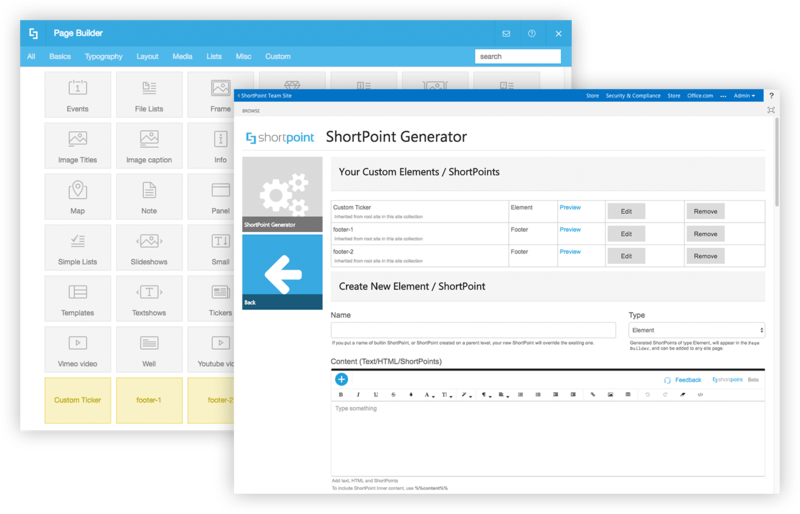 Go to your site settings, then under ShortPoint section open ShortPoint Dashboard, and then Create New Elements page. What type of content are supported? Can I use existing ShortPoint name? Yes you can, but you have to know that your new generated ShortPoint will replace the existing one. Where can I find the generated elements?